The visual impact of this Brunswick Streeter is immediate and effecting. At the same time, however, it seems muted and perfectly suited. That's why architectural firm Six Degrees has the reputation it does for creating memorable and inspired spaces. The restaurant feels undoubtedly Chinese: its namesake adorns the wall in a vivid portrait, tea-sets sit atop partitions between the tables, and the cushioned bench seat is embroidered with Chinese characters - but this is no Chinese takeaway. The sweet and sour pork and honey lemon chicken familiar to suburban Chinese diners the western world over is Cantonese cuisine. 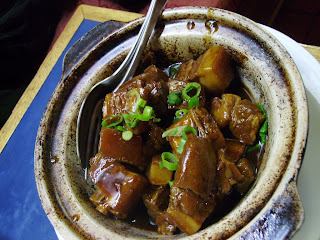 At Mao's, the regional fare on offer is Hunanese. Seafood features strongly on the menu, as do pork and duck. Eggplant seems to be the vegetable of choice for the dishes sans meat. 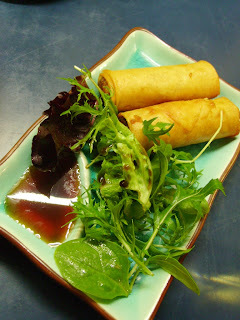 Our vegetarian selection, however, was limited to spring rolls. The entree consists of two pieces, but they are of a size that makes them worth at least double the smaller variety (compare a recent serve at Thaila Thai). I liked that you could see the pointy end of the (presumably very recently) rolled wrapper. There was no wasted space inside: each roll was dense with Chinese mushrooms, cabbage, sweet potato (noted as 'yam' on the menu) and vegetables, which meant you hit the peppery filling as the flaky pastry dissolved on your tongue. The accompanying soy sauce was gratifyingly thick and clung to the rolls. Four pieces of spicy calamari arrived atop sliced chillies, onions and mixed lettuce leaves. The calamari meat was wonderfully firm. 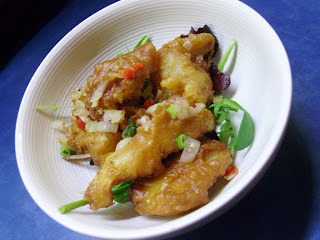 The batter was quite a thick, crispy one; I prefer calamari in a lighter batter, but on this occasion it filled out the entree very well. 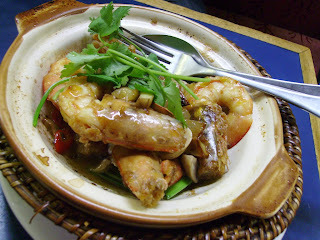 The seafood section of the menu looked very promising, and it supplied my choice of main: claypot king prawns with shallots, garlic, cinnamon and nutmeg. Shallots and garlic are common ingredients in Hunanese cooking, and they were prominent in this dish too: alongside jumbo prawns came quarter and half cloves of garlic. I love the stuff enough to always be happy to be able to see it in a dish! There were at least five king prawns, unshelled and (in at least one instance) unveined; so it was messy-finger time. The menu mentioned 'a touch' of cinnamon and nutmeg, and these sweeter spices certainly didn't imprint on the dish too strongly. Why go past a dish described on the menu as Chairman Mao's favourite, in a restaurant bearing his name and in which he smiles benificently at diners from the wall? (Dictators were a theme of the night, as I later found myself under Stalin's rather sterner gaze at Bar Open.) Hunan-style pork features a pot of chopped rib pieces with a glistening, thick sauce of dark soy, flavoured with garlic and star anise. Not surprisingly, the pork pieces were quite fatty but the dish fell short of being sickly sweet. There are some vegetables hiding under all that pork, their crispiness a nice counter to the tender meat. Overall, the flavours were pleasant and present; by which I mean, although my prawns came with spears of spring onion and visible garlic, and the calamari was sitting on big pieces of chopped chilli, none of those accompaniments overpowered anything. Just as the fitout was both familiar and unusual, this outcome was welcome and surprising: I wouldn't have wanted to come out with a numb mouth, carrying too strong a scent of any of the onion family members, but then again one would have expected more flavour bursts from such striking ingredients. That's not a criticism: I thoroughly enjoyed the balance of each dish, perhaps helped by the fact that Hunanese cooking often involves steaming, adding visual colour to dishes; and avoiding the overwhelming, oily glugginess that can make a lesser Chinese takeaway a regrettable choice. No such regrets here! This is a fantastic review. I love Mao's too and enjoy taking friends there. 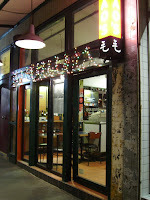 Have you tried Red Rice further south on Brunswick St? Thanks Fitz! I haven't been down to Red Rice, but having read your review of it I think a visit in order to try the duck is in order!